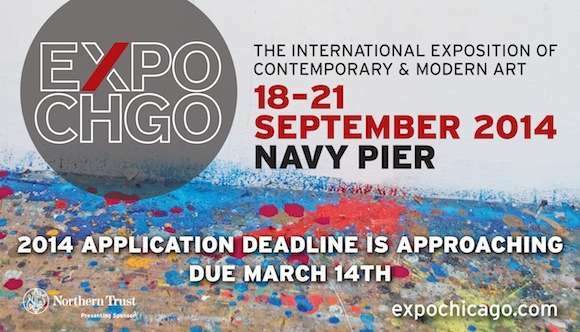 EXPO CHICAGO, The International Exposition of Contemporary and Modern Art, is currently accepting applications now through March 14 for the main exposition, EXPOSURE and Special Exhibitions. The third annual exposition returns to Navy Pier's Festival Hall September 18 to 21. Download EXPO CHICAGO/2014 applications here. In addition to presenting galleries in the main exposition, EXPO CHICAGO recognizes the importance of emerging galleries and artists. The acclaimed EXPOSURE section affords up to twenty galleries, in business seven years or less, the opportunity to participate in the exposition with special presentations of one or two artists. Additionally, EXPO CHICAGO is proud to offer a limited number of Special Exhibition areas for museums and international not-for-profits. EXPO CHICAGO remains committed to presenting its critically acclaimed onsite programming including IN/SITU, large-scale, site–specific installations, as well as EXPO VIDEO, a highly curated selection of dynamic and cutting-edge video art presented in conjunction with Columbia College Chicago. Chosen exhibitors of EXPO CHICAGO are welcome to submit proposals for IN/SITU and EXPO VIDEO once they are accepted into the exposition. With 30,000 visitors attending EXPO CHICAGO, the exposition attracts regional, national and international collectors, curators and art enthusiasts to Chicago each September.